In today’s fast-paced and connected world, it is increasingly critical to extend your marketing reach to customers through the use of multiple channels. With people constantly on the go or buried deep in their phones, if your message does not stand out, it is at risk of being missed entirely! So how do you engage today’s consumers and ensure your marketing message is reaching them? The answer is an omnichannel strategy, and IWCO Direct 1to1℠ offers an efficient solution for clients that creates a unified strategy across multiple marketing channels to deliver a personalized direct marketing experience. It’s very easy to overlook a marketing message or ad online, but what if you were able to get that same message in the mail? And then via email? And then via text? The message would be getting through even if at a subliminal level. 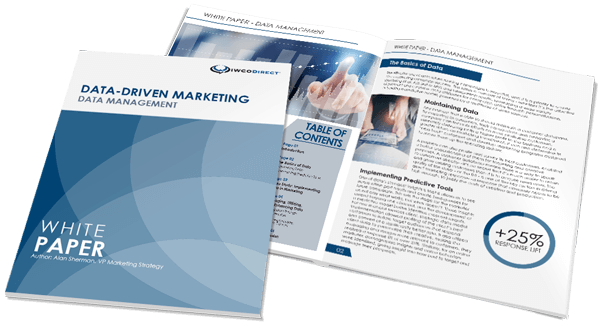 Although the use of a multichannel marketing strategy is effective, it does not create the same integrated marketing approach that omnichannel does. While multichannel and omnichannel can both use physical and digital marketing channels, omnichannel takes it a step further by creating a seamless experience and a persistent approach to marketing messaging. However, an omnichannel strategy should not be confused with being overly invasive. In fact, IWCO Direct’s omnichannel solution is very focused on customer experience because the message will reach your prospects on their own terms. If one consumer prefers email while another prefers direct mail, they can choose which channel to focus on without losing critical information. How does the IWCO Direct 1to1 omnichannel solution actually work? First, our clients log into a centralized platform that houses all of their messaging content and communication layouts. They then create their message and cascade it through their chosen delivery channels, including print, email, web, and SMS. Being able to leverage digital content and assets across a variety of communication channels, rather than continually recreating the same message, reduces our clients’ work effort and overall cycle time for change management. Using the same content across channels offers an identical look and feel, which creates marketing persistence and message reinforcement. When utilizing an omnichannel strategy, it is essential to see how the message will look in each channel to ensure you are creating that sought-after holistic experience for your target audience. That’s why the IWCO Direct 1to1 dynamic content management solution also offers clients the ability to revise and evaluate their messages with on-demand proofing. The platform will even output proofs that simulate the look and feel of a marketing piece across a variety of devices, operating systems, and applications to give our clients a 360-degree proofing experience. Consumers today are inundated with marketing messages, especially through the web and email. At IWCO Direct, we continue to explore innovative and effective ways to partner with our clients to achieve their marketing strategy and goals, no matter the channel. In addition to offering a powerful, central platform, IWCO Direct 1to1 simplifies the creation and delivery of omnichannel messages, ensures consistent brand voice and identity, and utilizes an effective and integrated marketing strategy. To learn more about IWCO Direct 1to1 and its omnichannel capabilities, contact me here.